In this team drill there will be 5 players line up on the court. Two of the players posted on the baseline on either side of the basket. Three players are situated around the 3-point arc. You will be using a half court and will need plenty of basketballs. The coach can start the ball by throwing to either wing player. The three wing players swing the ball around the three point arc. As the ball swings the onside baseline player slides along the baseline outside while the backside post player flashes to the top of the key. When the ball is done swinging the wing player can pass to either of the post players. The post that does not receive the ball cuts to the basket and receives a pass for a finish at the rim. 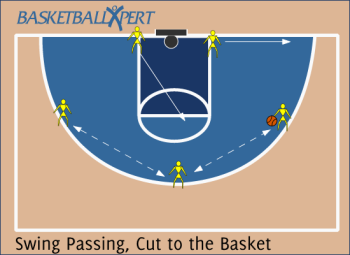 Once the ball goes into the post, use the cutter as a decoy and pass the ball back out for a 3 point shot. Or once the ball goes into the post fake the pass and shoot the jump shot. Etc etc. Focus on good accurate passing. Focus on good cuts from the post men. Focus on finishing at the rim.